We got a call from the school the other day “Oskar’s covered in mud, could you bring some more clothes down?” They really weren’t joking; unless the world under 6 bog snorkelling championships were in town, Oskar was at that point without doubt the muddiest boy in Hobart. 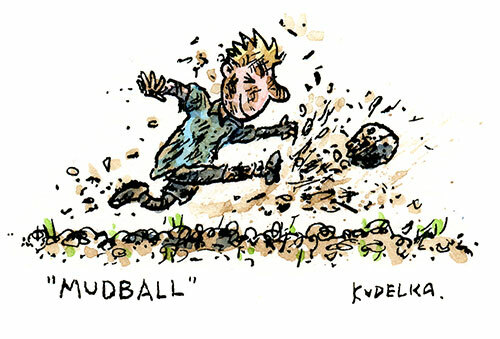 Oskar used to be quite a fastidious chap, but now he’s started playing soccer his relationship with mud has come along in leaps and bounds, and spectacularÂ dives, which he seems to have picked up from watching the World Cup. People often say Hobart’s got the second lowest rainfall of all the capital cities, but in winter we do seem to have more than our fair share of mud, and most of it’s on Oskar.Â I went to Mount Stuart Primary where it was a statutory offenceÂ to play anything but hockey andÂ have fond memories of ten metre slide tackles through the muddy slush at Wentworth Park on rainy Saturday mornings, sometimes using the hockey stick more as a spade to find the ball, both teams finishing the game in utterly indistinguishable uniforms, so I can’t really complain. Prints and originals available from the Phone Box Gallery. Jon, Really enjoying the stories that go with your drawings.